Today, you will learn how to cook lasagna and more! As you may already know, lasagna is a pasta dish that uses broad, flat noodles. It’s originally an Italian cuisine (like spaghetti) – but now, it’s being made (and enjoyed) all over the globe. What’s really great about lasagna is that it’s a versatile dish. You can serve it as the main course or as the snack. And because it’s truly delicious, everybody loves it – yes, even kids. There are many different variations and flavors of lasagna – and restaurants that serve pasta dishes usually have this type of food. However, if you want to save money or simply want to customize this dish, it’s doable, because it’s really quite easy to make. 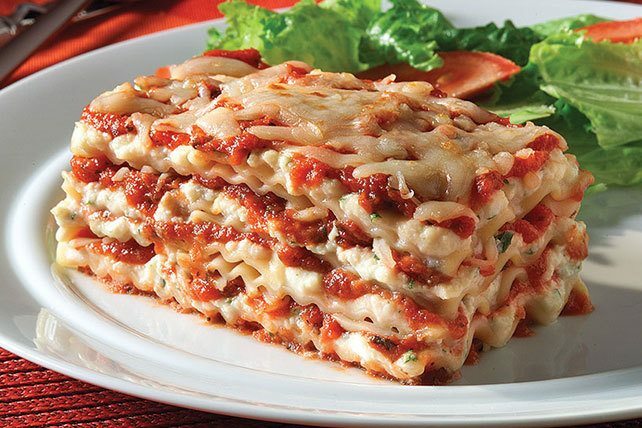 So, don’t be intimidated by how a lasagna looks like (especially the many layers) and how ﻿﻿t﻿﻿his food is served in restaurants. 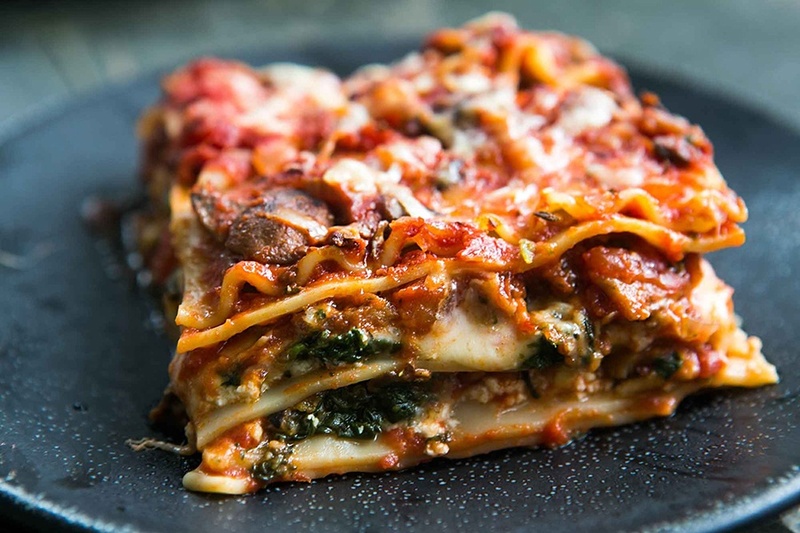 You will learn all the methods and techniques to cooking lasagna in this article, right now. 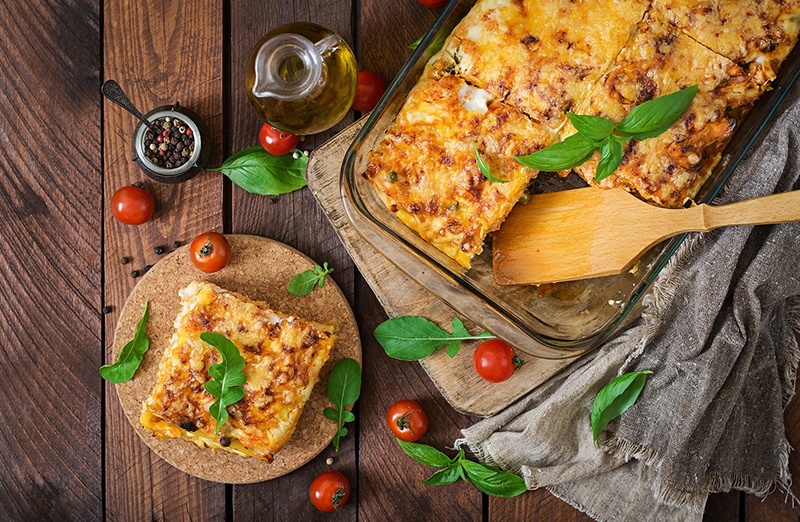 I also have a collection of the Top 10 yummy lasagna recipes for you in this article. What Does Lasagna Taste Like? How long does it take to cook lasagna? How long does it take to reheat lasagna in the oven? Is lasagna just spaghetti with cheese? Why does my lasagna always topple over like dominoes when I cut into it but restaurant lasagnas stay perfectly stacked? How can you avoid making a dry lasagna? How do you cut eggplants for lasagna? What temp to cook lasagna? What cheese to use for lasagna? 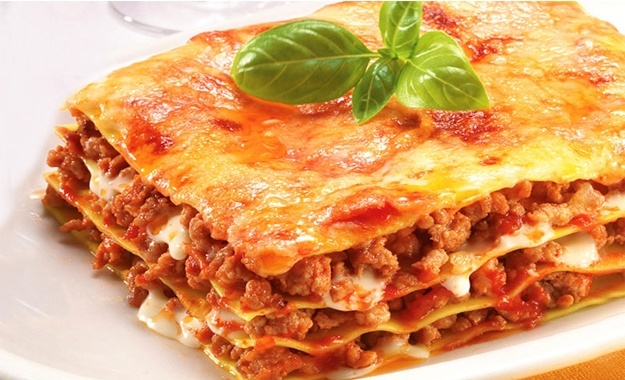 Lasagna (singular) or Lasagne (plural) can be referred to as a VERY tasty dish. 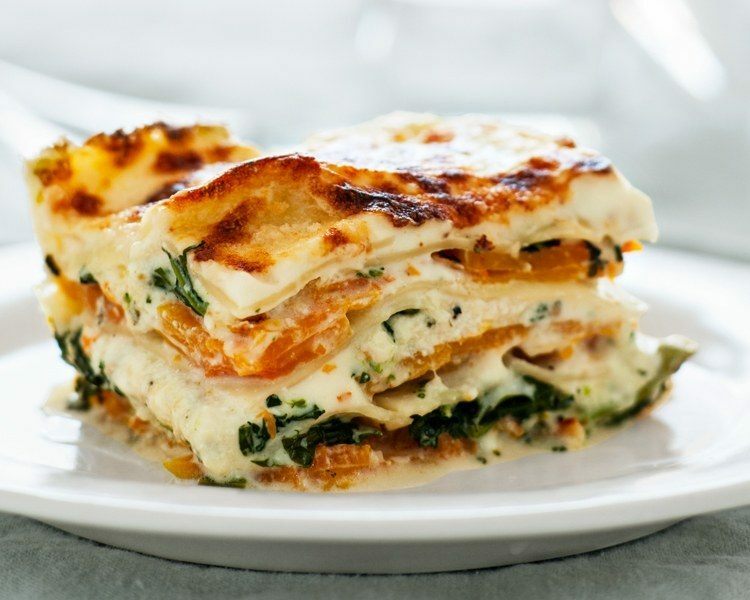 It’s made up of many layers of lasagna sheets (3 or more) that include mixtures of sauces, cheeses, and other ingredients. Typically baked, lasagna is usually made in a large batch (standard size is 13x9 inches) and can feed a number of people. This food is then served by cutting a portion of the whole dish so that individual servings can be eaten. According to the Book of Cookery that dates back to the 14 Century, the basic concept of lasagna already existed way back then in Italy. It was first served in Naples (a city in Italy) and the original recipe included layers of pasta, sausages, meatballs, eggs (hard boiled), and cheeses (particularly ricotta and mozzarella). Today, variations of lasagna exist all over the world. Typically tomato-sauce based, meats like beef, pork, chicken, and even fish can be used for lasagna recipes. Vegetables can also be used either as main ingredients or additional ingredients (such as zucchini, eggplants, spinach, mushrooms, and olives). 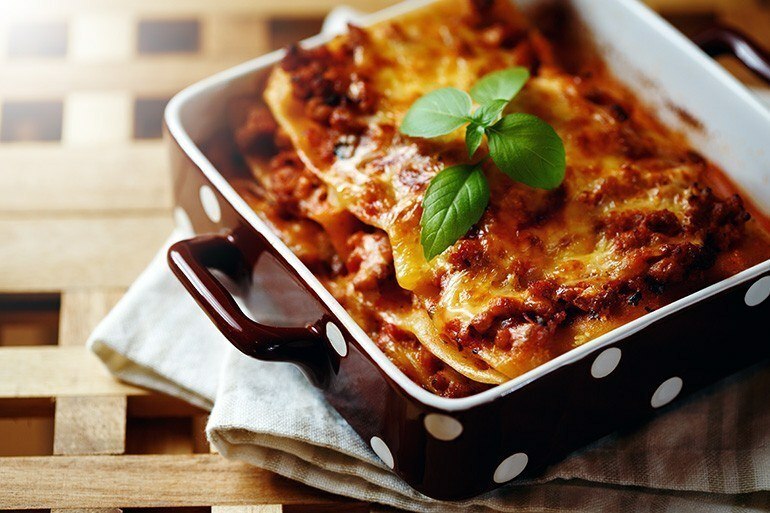 As a dish that’s really tasty and flavorful, herbs and spices such as onion, garlic, and oregano are also used in lasagna recipes. And for the cheese ingredient (which is a basic ingredient in a traditional lasagna recipe), more variations can now be integrated into the dish. So, aside from ricotta and mozzarella, cheddar, cottage, cream cheese, and other types of cheeses can be used in lasagna recipes. Lasagna recipes taste so good because they’re made up of a lot of ingredients and different herbs and spices. And so, all the flavors of meats, vegetables, seasonings, and flavorings all come together in one great blend. For meaty lasagna dishes, the meat flavors come out with a balanced flavor of the seasonings and spices (flavorings shouldn’t be overpowering). 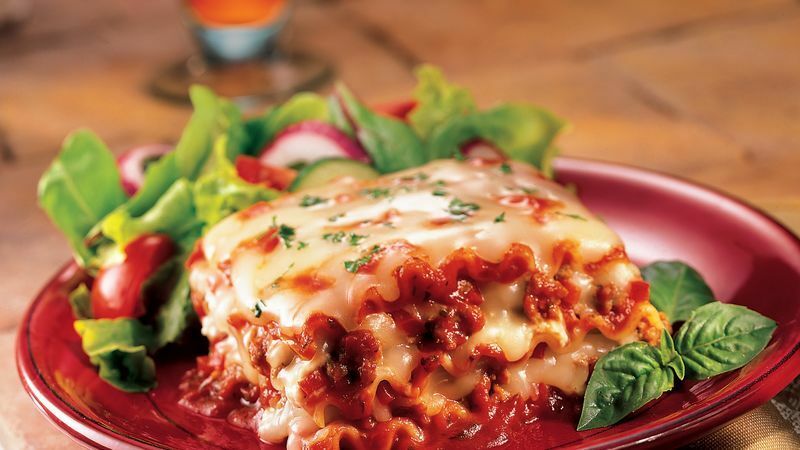 And the cheese – oh, the cheese – that distinct cheesy taste should be felt in every bite of lasagna. The way the pasta sheets are made is also important in making a lasagna. Aside from the creation of layers, the lasagna sheets should be firm (al dente), but not tough. And, no – it definitely shouldn’t be soft and soggy. Traditionally, lasagna dishes are made using ground beef and sausages as the main ingredients. These days, however, pork and chicken are also widely used (especially for homemade recipes). Basically, you just need to make a very flavorful meat sauce to layer your lasagna with. This is then alternated with layers of cheese mixtures. While you can incorporate vegetables in a traditional meaty lasagna, you can go all-veggies if you want to. You can even replace the lasagna sheets with vegetable sheets like zucchini and eggplants (just cut them thinly, lengthwise). In this example, the eggplant cutlets are used as lasagna sheets. Each layer is then comprised of tomato sauce, spinach, olives, pepper, and cheese. Simple (and healthy), isn’t it? Use tofu to thicken the sauce. The above ingredients will allow you to make a ﻿﻿﻿tuna sauce that’s tomato-based (using tomato paste) and a béchamel sauce as well. 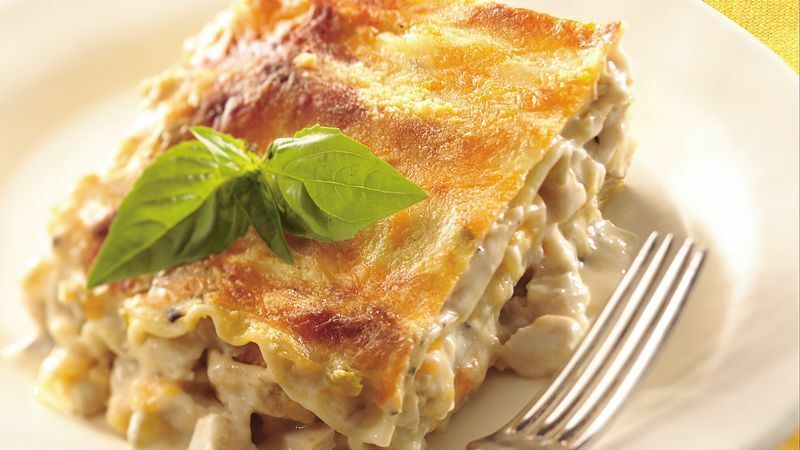 This lasagna recipe makes for a great option when cutting down on pork, beef, and chicken meat. When considering side dishes for your lasagna recipes, remember that this dish is typically high in starch and protein already. For this reason, serving it with vegetables (to balance it out, nutritionally) makes for a logical choice. For drinks, coffee, juice drinks, and any of your favorite drinks will surely go well with lasagna. For desserts, you can have fruits or sweet goodies. Traditionally, lasagna recipes are baked to perfection. While most (if not all) of the ingredients are already cooked, it still needs to be baked to get everything combined and the flavors blended well (and to melt the cheese ingredients, of course). 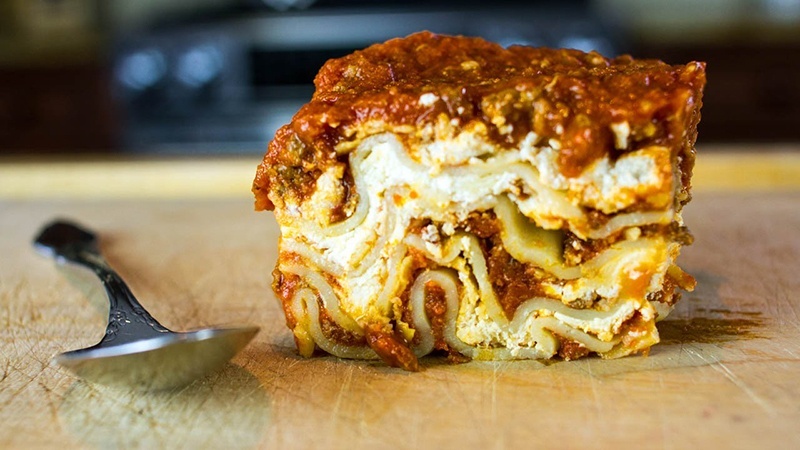 In this section, I will show you how lasagna is cooked the traditional way (by baking) and also by using a skillet and a crock pot (or slow cooker). Preheat oven for about 30 minutes beforehand to make sure that you’re baking at the right temperature. Place the lasagna tray in the middle of the oven for proper heat circulation and even cooking. Cover the lasagna while baking so as not to overcook (or over brown) the top layer while the middle layers are still cooking. Season with salt and pepper (and other herbs) as the meat sauce is cooking. Yes, it’s actually possible to cook lasagna over the stove, using a skillet. I will show you how you can do this easily and quickly in the example below. Since this recipe uses a ready-made jar of sauce, preparing this lasagna dish is quick and easy. The steps are broken down below. In a Dutch oven, cook the beef, onions, bell peppers for about 6 minutes (medium high heat). Remember to stir occasionally. Add all the other ingredients except for the cheese. Allow boiling before reducing heat and let it simmer. I am about to show you a way to cook lasagna in the slow cooker or crock pot. 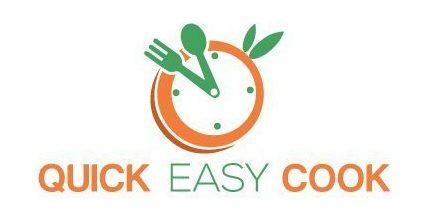 While cooking time can be anywhere from 2 to 4 hours, the actual procedure is simpler compared to making lasagna in the oven. Repeat layering with meat sauce, lasagna, and cheese. When making lasagna, you basically need to focus on the meat, cheese, and vegetable ingredients. And of course, on the type of sauce (or sauces) that you’re using for a particular recipe. The most common type of cheese used in lasagna recipes is Ricotta. However, since it’s not solid in form, you need to add beaten egg into the Ricotta mixture. We know that cheese ingredients add creaminess, richness, and flavor to any dish – thereby making it yummier and tastier. However, what you may not know is that cheese ingredients in a lasagna dish also act as binding agents. Yes, cheese helps in making layers of lasagna stay in perfect form instead of a gooey mess. When making lasagna, you can either use regular noodles or no-boil noodles. This section is dedicated to giving you step by step instructions on how to use these noodles in making lasagna. 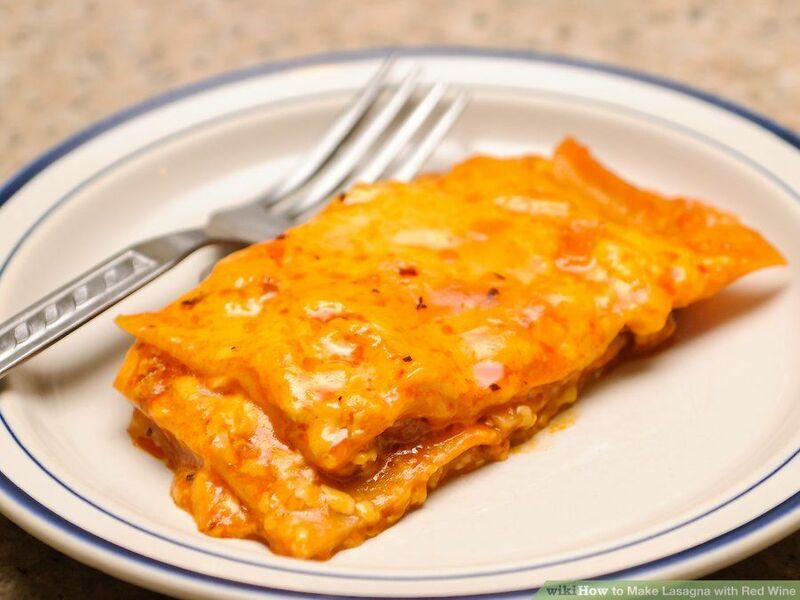 No-boil lasagna sheets are very convenient to use because they don’t need to be cooked or boiled. To use this type of lasagna pasta, follow the steps below. Remove the pasta sheets from packaging and make these accessible during the assembly process of your lasagna. When using meat sauce, make sure that the meat ingredient is fully cooked before using it in assembling and layering your lasagna. Lay pasta sheets on top of the sauce. While these can overlap, you can also trim excess portions of noodles to make everything fit into the dish. There are no hard and fast rules as to how to create your layers of lasagna – it truly is customizable, according to your preferences. Below are some tips on how to get more creative with your layers of lasagna. Use ravioli (meat, cheese, mushroom, etc.) instead of regular lasagna pasta. For gluten-free lasagna, use vegetables like sliced zucchini or eggplants to replace regular lasagna noodles. For meat sauces and mixtures, you can use leftover chicken or steak or whatever – just cut or shred the meat to small pieces. Once cooked, don’t immediately cut into the lasagna (or everything will fall apart). Instead, let it sit and rest in the baking pan, skillet, or slow cooker for AT LEAST 15 minutes. 30 minutes or more is actually better. After 30 minutes of rest (or so), the lasagna is already set and stable and can be sliced. Cut through the lasagna dish and serve a portion on a plate. Taste-wise and texture-wise, cottage cheese makes for a great substitute for ricotta cheese. It’s actually a healthier option, too, as cottage cheese is lower in fat content than ricotta cheese. You can still cook lasagna even if you don’t have an aluminum foil. The only reason why you need a foil is that baking lasagna requires trapping steam inside the baking pan so as to cook the dish properly (without drying it up). Therefore, if you have a cookie sheet or a baking sheet that fits over your baking pan, you can use that as cover instead of aluminum foil. If you really don’t have anything to cover your lasagna with, just make your lasagna sauce somewhat runny. This way, your dish won’t burn and dry up even when you cook it without a cover. There are lots of reasons why your lasagna can fall apart (especially when you slice it to serve it). Keep the following points listed below in mind to prevent lasagna from falling apart and becoming a gooey mess. 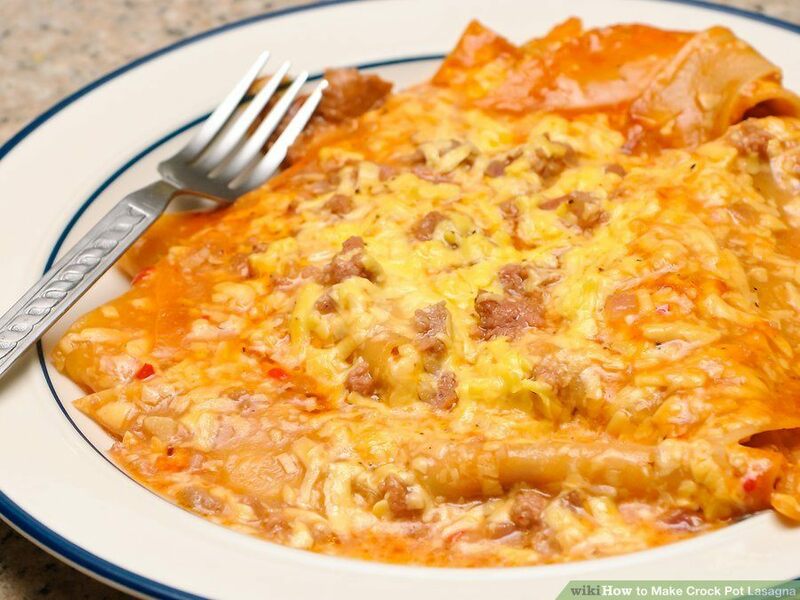 Undercook lasagna noodles (for few minutes) as the sheets will absorb extra moisture during cooking. Use just enough sauce (not too much) as runny sauce can result in unstable lasagna. Use thickened sauce. You can add tomato paste for tomato-based recipes. You can also thicken the sauce by allowing it to reduce in amount during the simmering process. Let freshly cooked lasagna rest for about 30 minutes to allow it to stabilize and stick together. If you’re using vegetables, cook or dry these first so as to reduce their moisture content. Add beaten egg/s to the cheese mixture as this will act as binding agent for the lasagna sheets. Aside from a delicious lasagna, we also want it to be presentable. Follow the tips below to have a firm and stable lasagna that can be sliced without collapsing. Grease the baking pan so that the cooked lasagna won’t stick to the bottom. Be generous with the first layer of sauce to prevent the pasta from sticking to the pan once the lasagna is cooked. 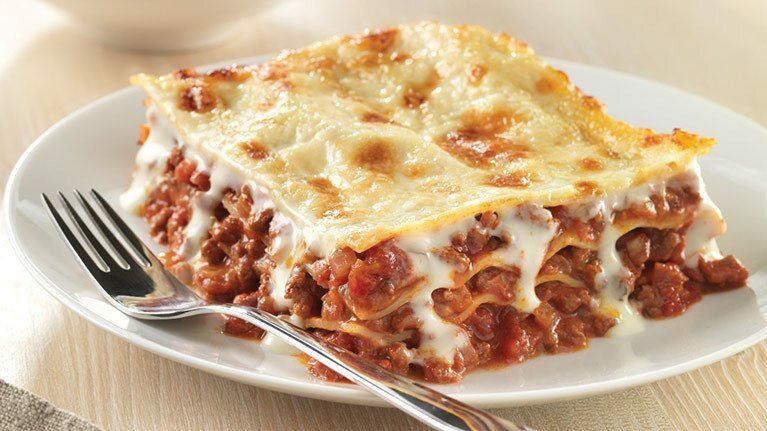 Allow cooked lasagna to rest for some time (30 minutes) so that any excess moisture will be absorbed by the noodles. Use a spatula to support the bottom of the sliced piece of lasagna. And if it’s really unstable, feel free to use another spatula to support the top layers. Don’t freeze twice. Once thawed, resist the urge to freeze leftover lasagna for the second time (food safety vs. bacteria contamination). For this reason, it’s best to freeze lasagna in serving portions so that you don’t need to thaw a large batch when you need it. Avoid using aluminum containers when freezing lasagna as it can give off a tin taste when stored too long in the freezer. Allow freshly cooked lasagna to totally cool off first before freezing it. Freeze lasagna by using freezer-safe, airtight containers. Put a label and date on frozen lasagna. It will remain in good condition for about 3 months. Below, I have listed some pointers for thawing lasagna. Don’t reheat partially thawed lasagna as this will result in uneven heating. Freshen reheated lasagna by adding chopped fresh basil (or other herbs) on top. Use a microwave-safe container to reheat a portion of lasagna. To prevent drying out, add some sauce or water in the container. Cover the lasagna during the reheating process. Heat on high setting for 1 to 2 minutes. Insert a food thermometer into the middle part of the lasagna. It should register 165 degrees Fahrenheit. Pour some water or sauce over the lasagna to prevent drying. Insert a food thermometer into the lasagna. The reading should register 165 degrees Fahrenheit. For effortless application of ricotta cheese, put the mixture into a Ziploc bag and cut it on one corner. You can then pipe the Ricotta cheese mixture over the sauce. If you don’t have the time to make your own lasagna sauce from scratch, you can just use the ready-made sauce in a jar. You can then customize the lasagn﻿﻿﻿﻿a sauce by adding your own favorite herbs and spices into it. Adding cinnamon will help all the flavors in your lasagna come together in a perfect blend. 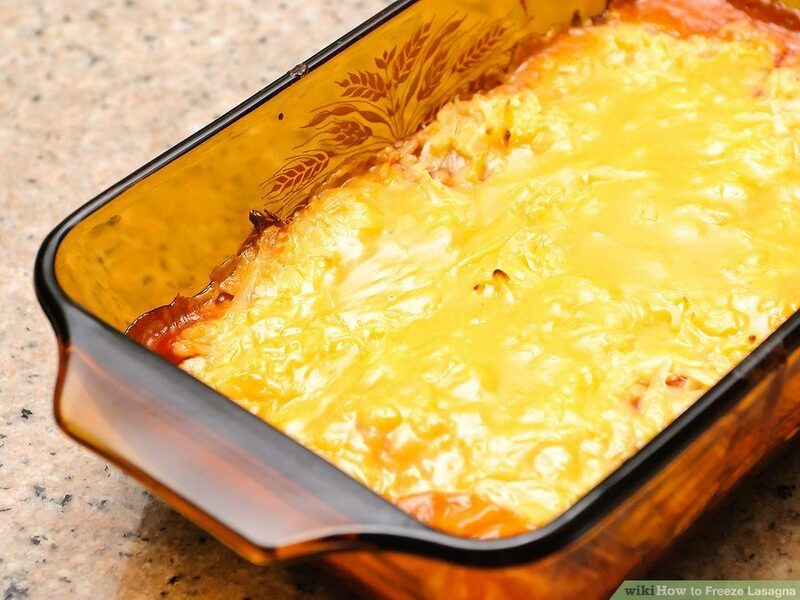 For perfectly melted cheese, cook lasagna at a lower temperature for a longer time. Invest in a lasagna pan. One that’s 13x9 inches is a good size (it’s the standard size for baked dishes). Also get one that’s 2 to 3 inches deep to avoid spillovers. Overcooked noodles will result in a soggy lasagna. If you’re using regular lasagna sheets that require pre-boiling to cook, it’s best to under cook them. Remember, you still need to cook the assembled lasagna dish again. To avoid cooked lasagna sheets from clumping together, lay these on an oiled baking sheet after draining and cooling them. 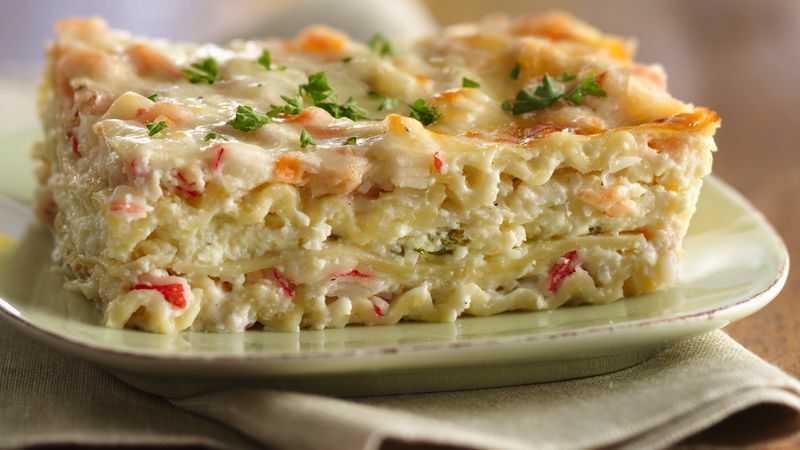 Starting with a layer of lasagna noodles is a grave mistake when making this dish. You must always (ALWAYS) start with a layer of sauce – this provides moisture to the dish to prevent sticking. 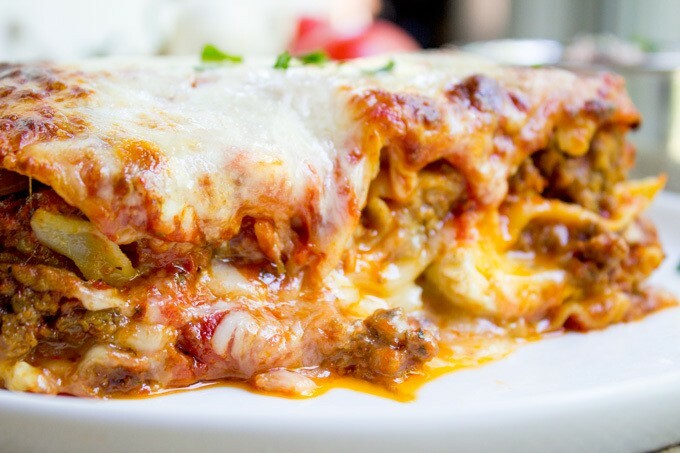 A standard baked lasagna dish has at least 3 layers. Having fewer layers is just weird (and wrong). Use a lid (aluminum foil is fine) to cover your lasagna while baking it to avoid burning and drying out. You only need to remove the cover during the last few minutes of baking to brown the top. Your lasagna can quickly dry out if you’re not using enough sauce and filling. You can stretch out sauce by adding chicken stock or wine to the mixture. Joan Wilen and Lydia Wilen are expert food writers from BottomlineInc.com. They’re also health investigators from New York, USA. According to them, it’s not necessary to cook lasagna sheets (yes, the regular kind). If you add extra moisture (sauce or water) to the recipe, the noodles will cook just fine during baking. 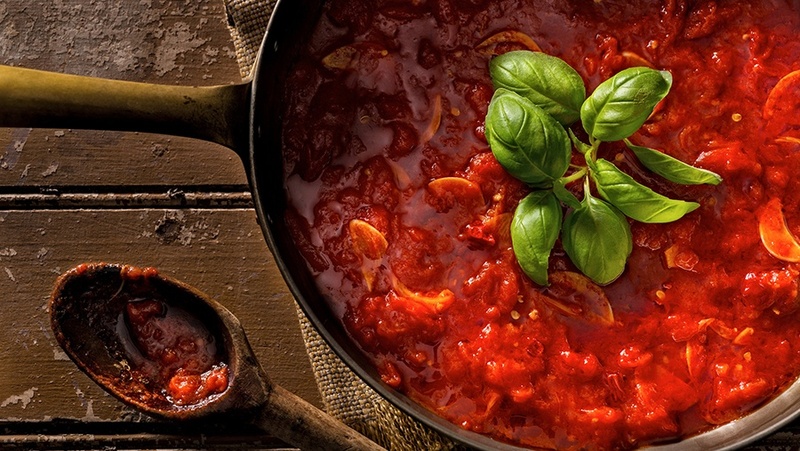 If you’re using Italian red sauce, oregano and garlic will complement this well. Basil and oregano will add sweetness to a lasagna dish and make it tastier. 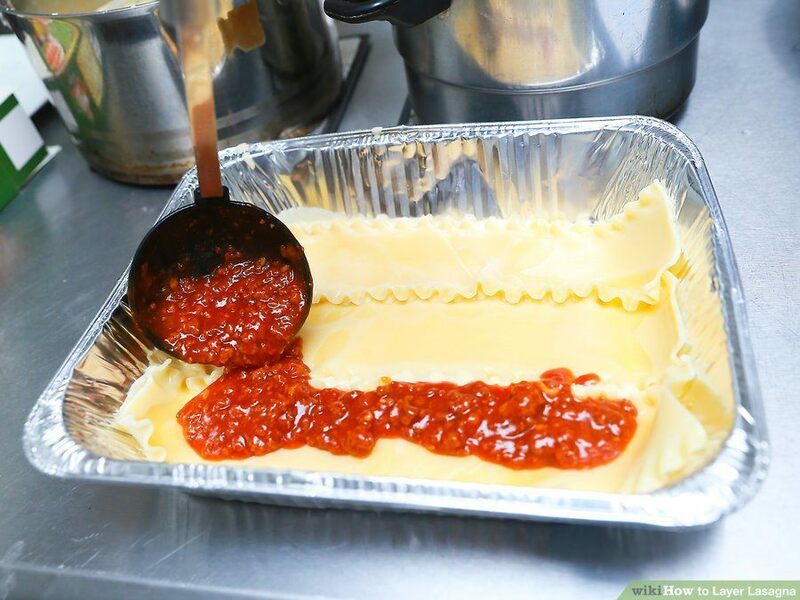 To minimize the acidity of tomatoes (for tomato-based lasagna), you can add sugar and baking soda to the mixture. For the meat ingredient, ground turkey or ﻿chicken is leaner options compared to beef and sausage. A typical lasagna recipe uses Ricotta, Parmesan, and Mozzarella cheese combination. 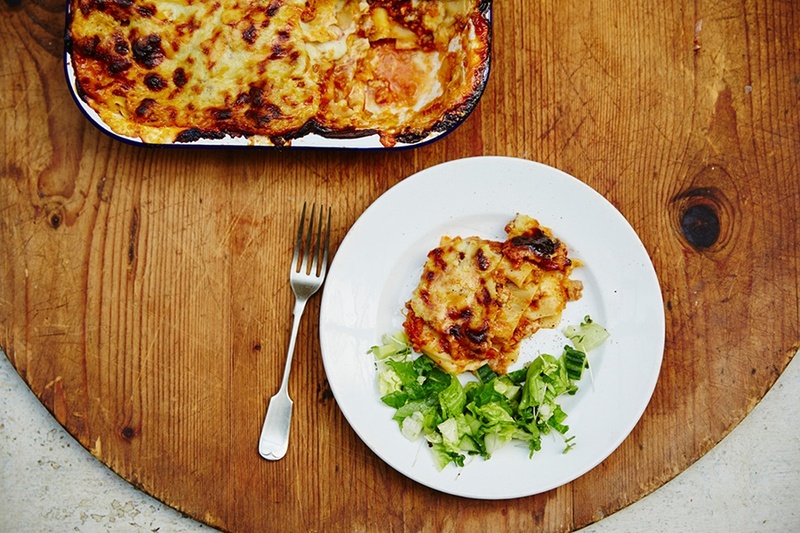 Consider adding Bechamel sauce to a tomato based lasagna recipe. It adds more richness and flavor to the dish. The final layer in the lasagna should be covered with a lot of sauce (to avoid drying out and brittleness) and a sprinkle of shredded cheese on top will make it perfect. Don’t bother making fresh pasta for your lasagna recipe. 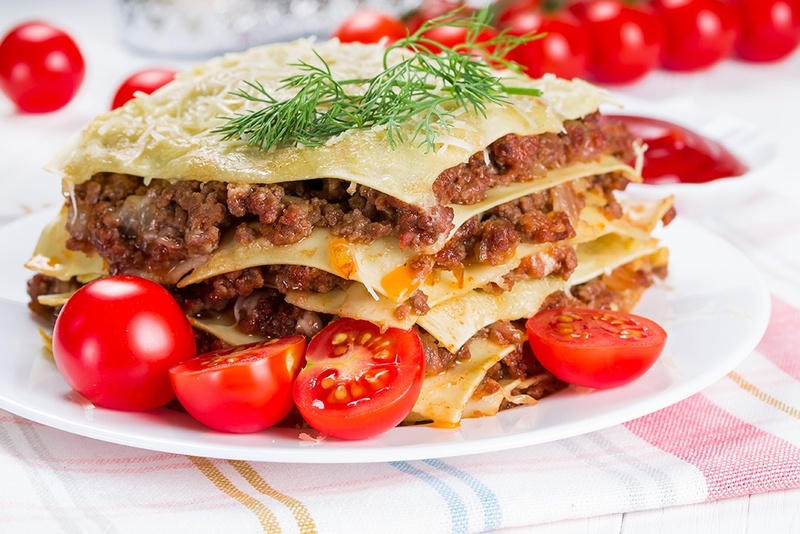 Aside from being troublesome, freshly cooked pasta can cause the lasagna to become soggy. For a gluten-free lasagna, you can s﻿﻿ubstitute﻿﻿ polenta for your pasta. Strain Ricotta cheese (using a cheesecloth) to avoid having a runny lasagna. Have fun in making your lasagna recipes. Experiment with different combinations of meats, sauces, spices, etc. 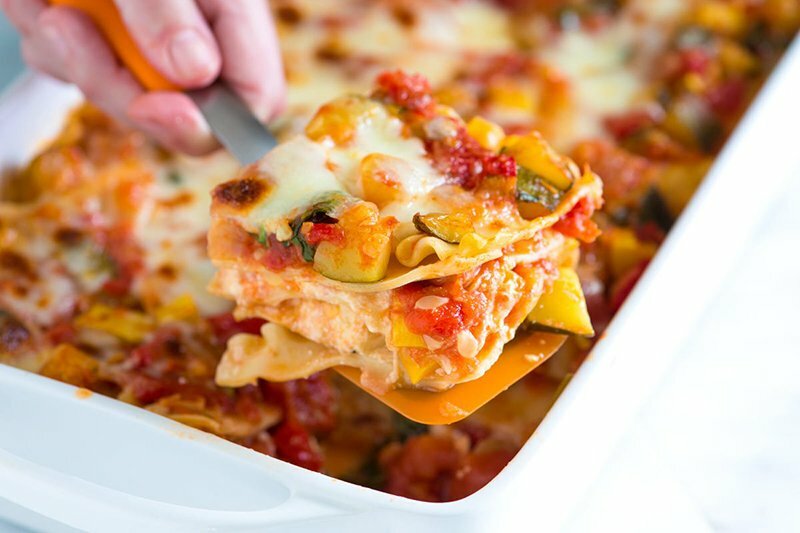 Keep an eye on the moisture content of your ingredients (especially vegetables) to prevent having a soupy lasagna. Use Italian sausage as the meat option for tomato-based sauces. The texture and flavor will come out just right compared to other combinations of ingredients. Use a generous amount of mozzarella cheese. And if you can use fresh mozzarella, the resulting lasagna will be even better. When using vegetables, remember that they’re full of moisture (and can make your lasagna soggy). Use only a few, and cook them first to reduce their water content. You can also drain them by squeezing out any leftover moisture after cooking them. 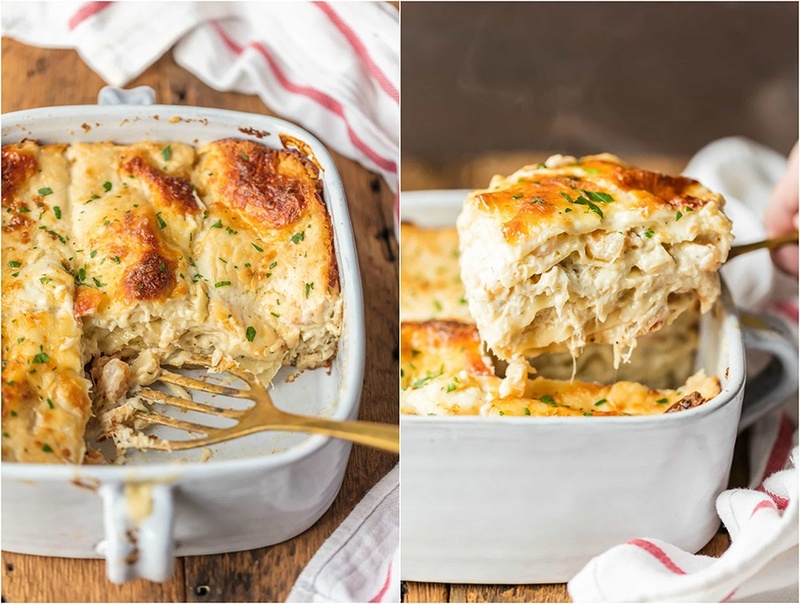 This recipe tastes like real lasagna (well, it is) – it actually tastes meaty because of the mushroom ingredient. And since it's loaded with vegetables, this dish is high in vitamins and minerals compared to the typical meaty lasagna. You can use your favorite spaghetti sauce in this lasagna recipe. Once assembled, it only takes around 45 minutes to bake. With all the herbs and spices used in this recipe, you can already tell that it’s a tasty dish in spite of being meatless. And since it requires you to make your own marinara sauce from scratch, you can also customize it according to your taste. This lasagna soup uses chicken broth infused with tomatoes. In a nutshell, it’s a soup version of your favorite lasagna dish. The ready-made jar of sauce makes this recipe very easy to prepare. It’s also ideal for freezing – so, you can prepare a whole batch for later consumption. For the Italian sausage, you can either use the mild or hot variety (or a combination of both). This recipe is a truly tasty dish because it uses a lot of herbs and spices and a combination of different cheeses as well. This recipe definitely requires a lot of work and time, but it’s all worth it. You can actually prepare the pasta and sauces in advance, to divide the work. 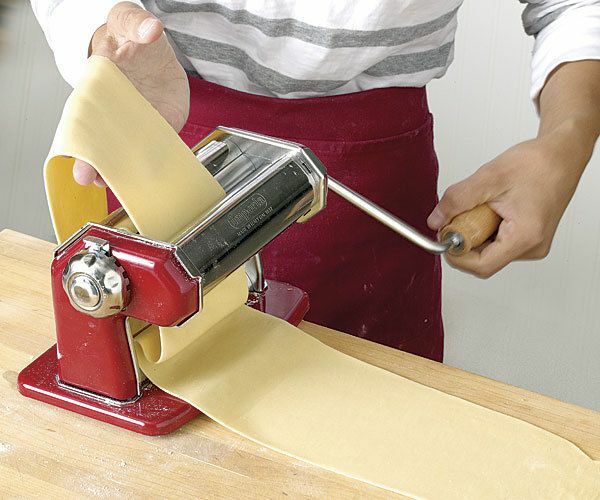 By the way, since this recipe requires you to make your own pasta, you need to have a pasta maker. However, you also have the option of just using ready-made pasta. Yes, it uses the ready-made sauce in a jar – but make sure that you season it with your favorite herbs and spices to customize (and improve) its taste. This recipe is tomato-based – and tomato sauce goes really well with A LOT of cheese, right? 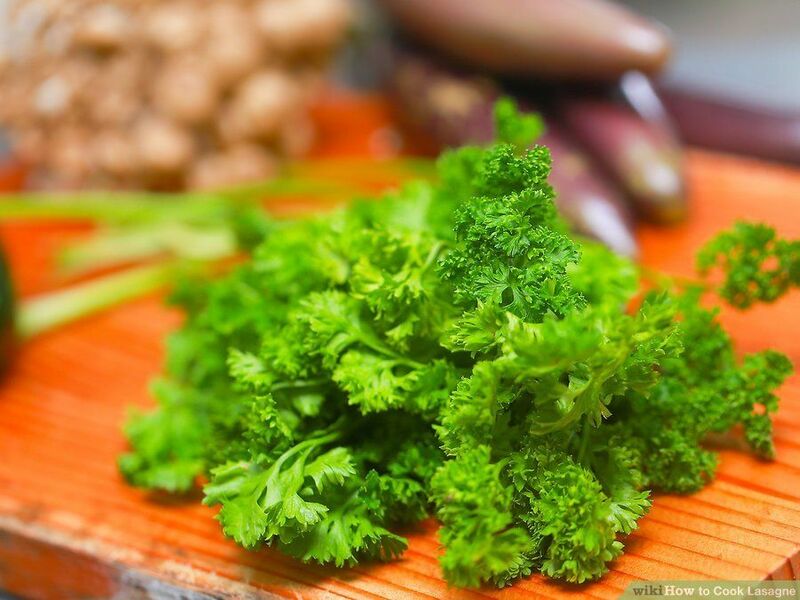 With the other herbs and spices included in this recipe, you can be sure that it’s bursting with flavors. Carbohydrates – Pasta is rich in carbohydrates. So, if you’re using lasagna sheets in your recipe, a 2-ounce serving of this dish will provide you about 40 grams of carbs. 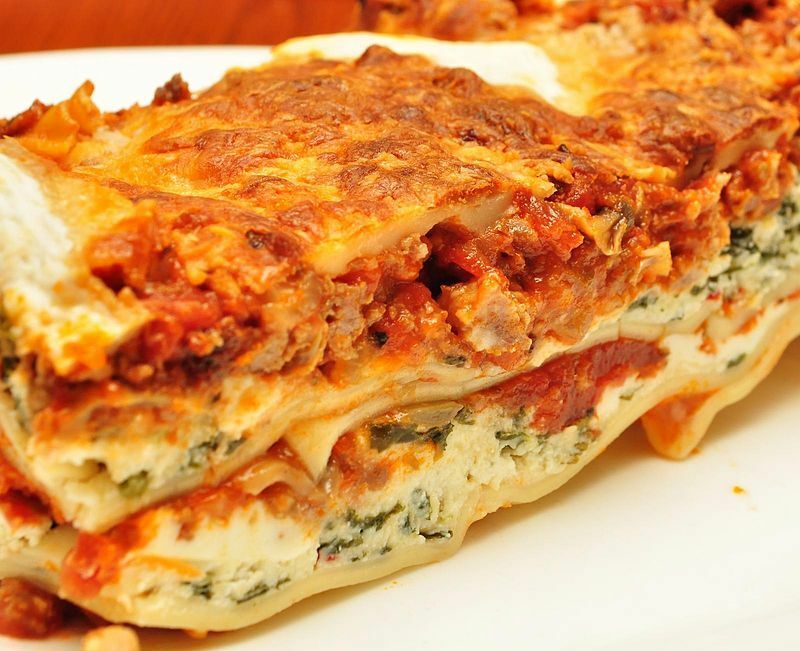 Protein – Meaty lasagna recipes are particularly high in protein. 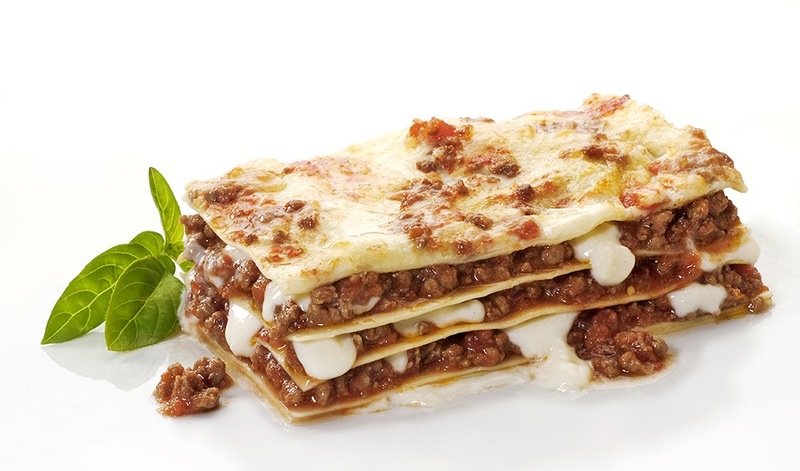 An ounce of meat content in your lasagna will give you around 7 grams of protein. And if you’re using mozzarella cheese (which is also high in protein), this will provide you with an additional 6 grams or so of protein. Fat – Meat and cheese ingredients also carry fat. If you want to avoid saturated fat in your dishes, use minimal meat and cheese ingredients. Also, if you add vegetables to your lasagna recipe (such as spinach, zucchini, bell peppers, etc. ), this will increase its Vitamin A and Vitamin C content. Tomato based lasagna recipes are high in lycopene. Lycopene is an antioxidant that’s particularly helpful in combating free radicals that can cause cancer and other serious diseases. As we all know, increasing one’s intake of vegetables helps in preventing diseases like diabetes, heart problems, cancer, etc. You have the option of using whole grain pasta in lasagna. Whole wheat is healthier than refined grains since it’s higher in fiber, vitamins, and minerals. 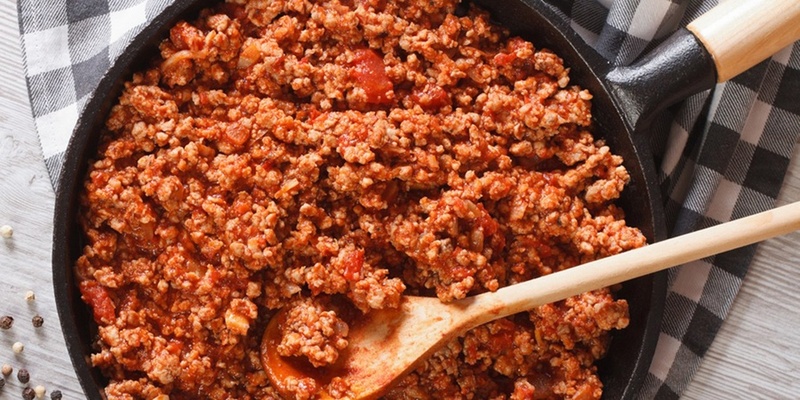 Use Italian Turkey sausage over ground beef and pork as this is leaner in nature. Add mushrooms to replace meat in your lasagna. Mushrooms provide meaty taste and texture and are lower in calories and fat content. Use skim and low-fat types of cheese instead of the full-fat versions which are high in saturated fat and calories. Lasagna typically requires 45 minutes of cooking time in the oven. Typically, it takes around 20 minutes to reheat a pan of lasagna in the oven. Lasagna uses broad, flat noodles while spaghetti pasta is long, and not that thin. Lasagna noodles are basically made from flour and eggs. Spaghetti dough uses water and flour. Most of the time, it’s one of 2 things – your lasagna either has too much moisture (too saucy) or you didn’t allow it to rest (and become stable) before you cut into it. The best way to avoid having a dry lasagna is to make sure that you use enough sauces. Having just the right amount of moisture will result in juicy but firm lasagna. If you’re going to substitute eggplants for lasagna noodles, cut it into many thin pieces lengthwise. 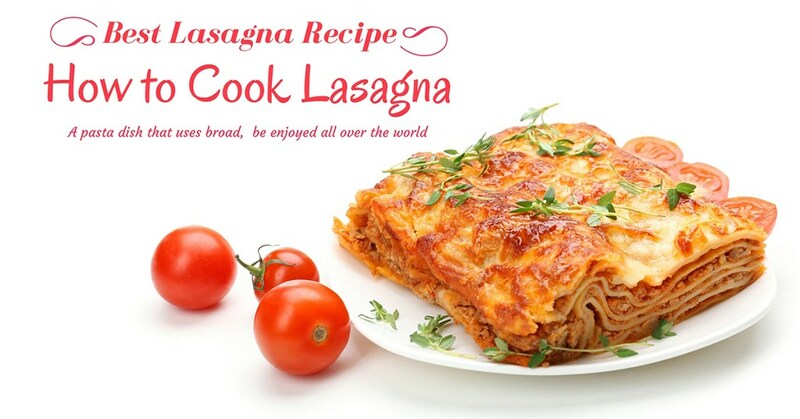 The standard cooking temperature when cooking lasagna is 350 to 375 degrees Fahrenheit. 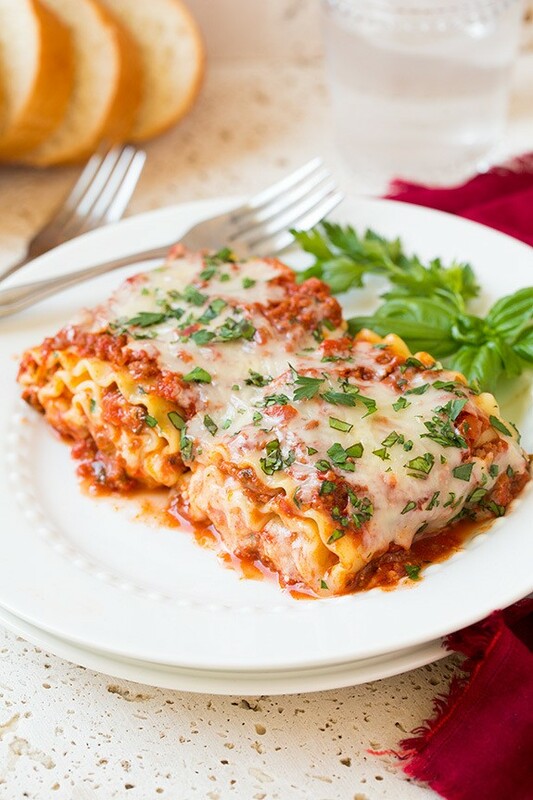 The most common cheeses used in lasagna are Ricotta, Parmesan, and Mozzarella. However, you can also use Cottage cheese, Goat cheese, Gruyere, Gorgonzola, Fontina, Asiago, Brie, Cheddar, and other types of cheeses. While lasagna is not diet food, you can customize recipes to make it healthier without sacrificing its flavor and texture too much. 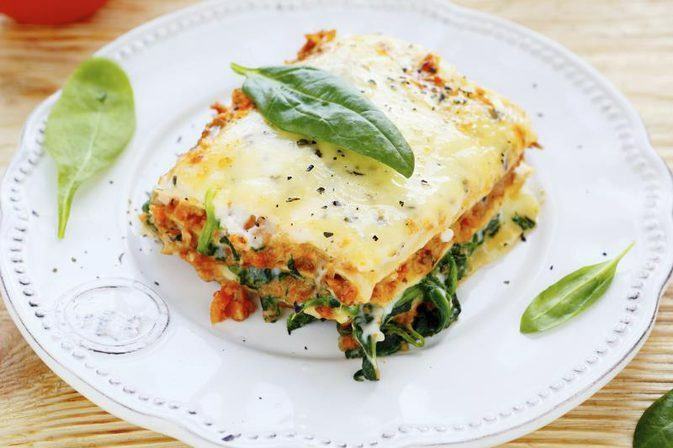 Vegetables go really well with lasagna dishes – so, you can up your veggie consumption in the process as well. When eaten in moderation, lasagna is a filling and satisfying dish. Its versatility also makes food preparation (and consumption) more enjoyable. We all love lasagna – that’s a fact! Let me know your thoughts about this post if lasagna is one of your favorite foods, ok? You can also share it with your friends (especially the many recipes included in this article).